December | 2011 | life with three boys and a splash of purple! 12/19/11 (Monday) – The boys have been spending time with me in my sewing room while I sew. I have a hard time concentrating while they are down there with me. I made many mistakes on a few of my projects which caused some delays and a lot of frustration. Tonight was when I was able to focus on what they wanted to sew. We didn’t finish the items for Christmas or for a photo this week. Henry won’t mind when he opens his gift. 12/20/11 (Tuesday) – I went to the feed mill today and was pleased to find out that they know me by name, and weren’t calling me “the chicken lady.” Except they had the wrong name and were calling me Patsy. (Remember my post Small Towns?) While I was there waiting for my feed to be ground up and bagged I met another customer who was looking to purchase laying hens. We exchanged numbers and set up a day for him to come look at my chickens. When I called him to arrange a time his wife said, “It’s the chicken lady.” I am okay with being called the chicken lady, not Patsy. I finished this dolphin apron for a friend. And this cardinal for a bag. 12/21/11 (Wednesday) – I rested a lot today after a few busy days. I didn’t really want to rest but my body was telling me I needed to. I felt better by evening and was able to finish sewing a few of my Christmas gifts. 12/22/11 (Thursday) – I tried taking it easy today wrapping gifts, getting ready for Santa’s arrival, and packing for the weekend. We left for the Owen/Loyal area after the boys got home from school. We spent the evening with the Eloranta family eating great food, visiting, eating more yummy food and taking the annual group photo. 12/23/11 (Friday) – We spent the day with the Vaters. 12/24/11 (Saturday) – While we waited for my brother and his family to arrive at my Mom’s house we walked down to the pond to play on the ice. Grandpa Jerry surprised us with sled rides behind the 4-wheeler. Four of the seven grandsons in our family were together today. We missed our other cousins this weekend! 12/25/11 (Sunday) – We were home Christmas morning. The boys surprised me by sleeping until 6:45am! After breakfast we opened gifts and both big boys got right to work at putting their new Legos together. 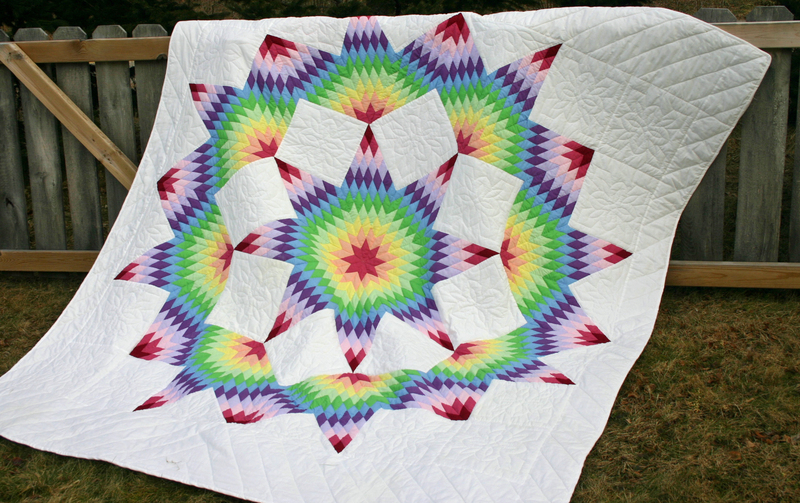 These were the largest pieced sets they have ever done. Both with minimal help from us. Charlie used his new container from Granny that has different sections to sort his parts. Their new Star Wars ships. Henry’s baby quilt was finished just in time for me to give it to him for Christmas. Surprise! Surprise! My Candy Loving Boy was busy eating all the candy in his stocking and sneaking candy from other people’s stockings. 12/5/11(Monday) – I did a test pattern on my embroidery machine of a poppy. I wasn’t sure how it was going to go or even how long it would take. My machine told me that this pattern was for 64,000 stitches and failed to mention that it would take almost five hours. Thankfully, I don’t have to sit there for all of those five hours. My only requirement once the machine is set up and started is to change the color of thread at the designated times. The threads for the poppy design. The flower turned out much prettier than I expected so I decided to make a bag with it. I also made a small zipper bag with an awesome rooster embroidered on it. I don’t have a photo because I lost the bag! I finally cut my last batch of soap. I hope it will be dry for Christmas gifts. 12/6/11 (Tuesday) – A friend wanted aprons for her daughters and daughter-in-law. The daugther aprons match the granddaughter aprons I made in July. Tuesday night I had a board meeting at the ski hill and came home to find this note. 12/7/11 (Wednesday) – A friend asked me to make tooth pillows for her two girls. You can see that huge gap where the snow blows in, what you can’t see is all the little holes all around the window. He was happier once we got into the house and needed to put the eggs away. 12/9/11 (Friday) – Jack’s early Christmas present arrived today. It is a TV with a built in DVD player for his exercise area. He was using an old laptop for his exercise videos. We have always used our computers to watch movies since we don’t have a TV in our house, until now, I think we will refer to it as a DVD player. 12/10/11 (Saturday) – Robbie and Charlie had their piano recital today. Henry thought he should be able to go up on the stage to play piano too. We took a family photo since everyone was in nice clothes this afternoon. 12/11/11 (Sunday) – We cut down our Christmas tree from behind the garage. These were some of the first spruce trees I planted during our first couple years here. It is amazing how fast they have grown. This one was slightly bent/damaged from the heavy snow we had in November. Each boy got a turn to trim the trunk for easy sawing. This is our smallest Christmas tree. I think it is my favorite mainly because I love Colorado blue spruce trees! 11/29/11 (Tuesday) – I finished my zipper bag that matches my big sewing bag. 11/30/11 (Wednesday) – Henry and I met my friend Phil at the ski hill to peel potatoes, 100 pounds of potatoes, for Phil’s Lefse Making Party! I am an experienced potato peeler because I peeled potatoes almost every night after school from 7th to 12th grade. 12/1/11 (Thursday) – I love how my little zipper bag turned out, so I made three more. I am getting better at this and will try to make more in different sizes. 12/2/11 (Friday) – I met my friend and her son at the Stevens Point Library. This was my first time in the children’s section. It was wonderful! 12/3/11 (Saturday) – Jack took all three boys to Aunt Vlasty’s house for her annual St. Nick’s party. This was the first time all three boys left me at the same time. I stayed home. I was gearing up to get a lot of sewing done while the house was quiet. Guess what I did? The most unusual things…cleaned the kitchen, swept and mopped, cleaned the living room, vacuumed the stairs, tons of laundry, fed the dogs and took care of the chickens. I spent about 15 minutes on the computer (very unusual! ), baked two pans of apple crisp, prepared a Quinoa and Black Bean Salad and then got ready for the lefse party. By the time I got everything done I was so tired and my belly muscles were aching, I didn’t go down to my sewing room. I took it easy at the lefse party, washed a few dishes and sampled all the food that was brought for the potluck meal. In the morning Jack asked what kind of sewing I did while they were gone. I told him I didn’t sew. I cleaned instead. He looked around and said “What did you clean?” Not because he isn’t an observant and appreciative husband, because the cleaning I did was only that “surface” cleaning that gets messed up once children are present for an hour. It felt good to have that cleaning done. I don’t regret spending valuable sewing time to do it. I kept telling myself there are women out there in this world that sacrifice fun times for a clean house all the time and I am not one of them! 12/4/11 (Sunday) – Aunt Susie took the older boys to a donkey basketball game. When she arrived the boys hid behind the door waiting to surprise her.